This morning, the Chattachoochee and Chestatee Rivers are flowing at a combined 8,440 cubic feet per second, and the discharge at Buford Dam is 583 cfs, for a net inflow into Lake Lanier of 7,857 cfs, not counting rain falling onto the surface of the lake, inflow from minor tributaries, and direct inflow from the shoreline. The lake has risen more than 3 feet since last Friday, and more than 1.5 feet since yesterday morning. With perhaps another 0.75″ of rain forecast for today and Saturday, and with the ground already fully saturated, the lake will continue to rise significantly, and could easily rise another 6-12″ over the weekend. Check your dock poles and shore anchor lines to make sure your dock doesn’t break free from its moorings. 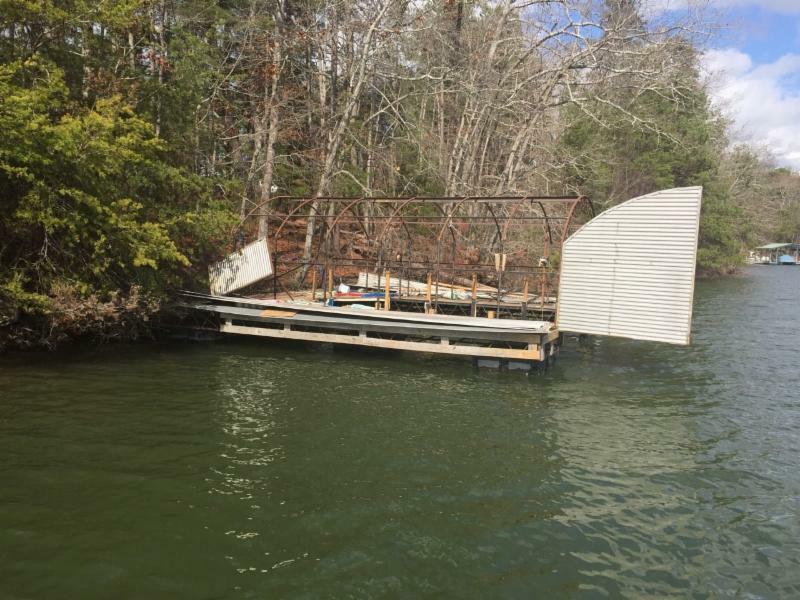 Courtesy alert to Lake Lanier Association members: with the high rainfall around Lake Lanier and especially in the watershed above the lake, dock owners should make sure their docks, including anchor poles, can handle the expected surge in the lake level. Current inflows into the lake are running at a rate of about 12 times higher than the outflows from Buford Dam. The lake has already risen over a foot today. With inflows of over 20,000 cubic feet per second we can expect even higher levels. 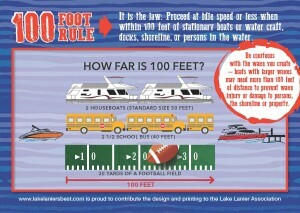 LLA is kicking off a boating safety campaign in 2019 related to awareness of the 100 foot rule. This postcard is the first piece of that campaign and we will start distributing these postcards at the boat show in January – along with some other swag related to this same concept. Can’t wait to get these out into the community! 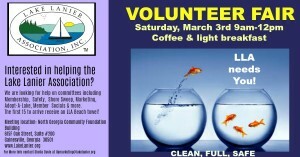 Join us for our Volunteer Fair on Saturday, March 3rd 9am-12pm! 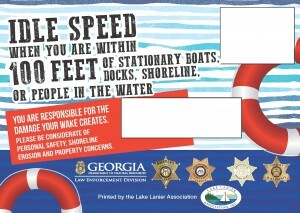 Security Camera Prohibition Removed on Lake Lanier! Great news! 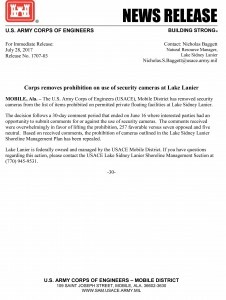 Security camera prohibition lifted at Lake Lanier! Special thank you to Congressman Rob Woodall for his involvement in getting this policy reviewed! Public Comments For Security Camera Policy! Deadline To Submit June 16, 2017! 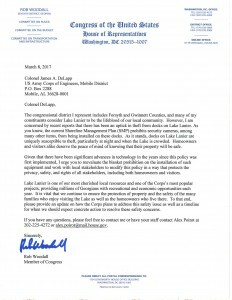 The Corps of Engineers has agreed to review their policy of prohibiting security cameras at private docks on Lake Lanier. They have issued a call for public comments on that policy and, based on those comments, that policy will either be upheld or repealed. 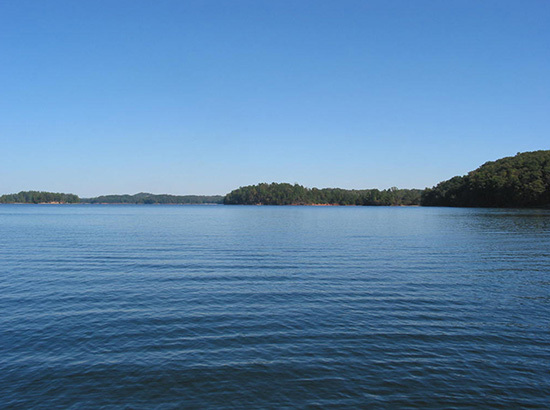 The Lake Lanier Association is in favor of the policy being repealed. The Corps of Engineers has stated that the policy was based out of concern for individual privacy while recreating on public land. We feel that, given the great majority of persons recreating on the lake in possession of a mobile device with photo and video capabilities, that concern is no longer applicable. We also feel that cameras would benefit public safety and be an aide to protecting personal property. We would like our members to submit comments to the Corps of Engineers regarding this policy. There is power in numbers, so please send your comments in. The deadline for comments is no later than June 16, 2017. 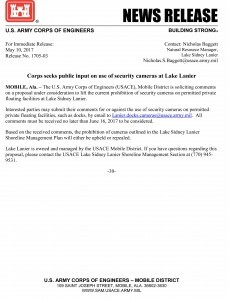 Send your comments by email to Lanier.docks.cameras@usace.army.mil. Below is that press release regarding this matter issued by the Corps of Engineers.